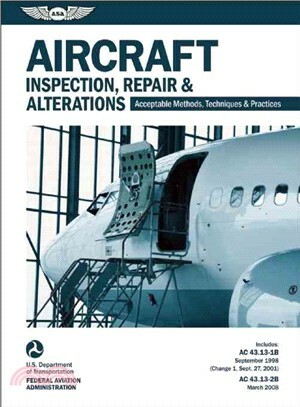 A combination of the two most important Advisory Circulars written by the Federal Aviation Administration on the topic—namely, “Aircraft Inspection and Repair” and “Aircraft Alterations”—printed and bound into one volume, this handbook for Aviation Maintenance Technicians, repair stations, and aircraft owners details the standards for acceptable methods, techniques, and practices for the inspection, repair, and alteration of aircraft. The details and standards for methods and practices covered in the guide are applicable to nonpressurized civil aircraft with a gross weight of 12,500 pounds or less. The first half contains information on finishes for wood structures; fabric covering; fiberglass and plastics; and metal structures, welding, and brazing. It includes chapters dedicated to nondestructive inspection, corrosion, aircraft hardware, control cables and turnbuckles, engines, fuel, exhaust, propellers, aircraft systems and components, weight and balance, and electrical systems, among others. The second manual provides instructions for the installation of aircraft components and systems, such as communications, navigation, and emergency systems; anticollision and supplementary lights; skis; oxygen systems; rotorcraft external-load devices; cargo slings and external racks; glider and banner tow-hitches, aircraft batteries; and more. These combined manuals provide this pertinent information where no manufacturer repair or maintenance instructions exist. The Federal Aviation Administration (FAA) is the agency of the U.S. government with primary responsibility for the safety of civil aviation.